Nokia will launch the Lumia 900 smartphone in the UK in June, according to Carphone Warehouse. The 4.3-inch Windows Phone Mango device was praised upon its debut at CES 2012, but until now has been billed as an AT&T exclusive in the United States. The listing on Carphone Warehouse's website gives Nokia fans the opportunity to pre-register for the device, which is stamped with an "expected June 2012" icon. Nokia is yet to reveal launch plans for its third Windows Phone handset outside of the United States agreement with AT&T. 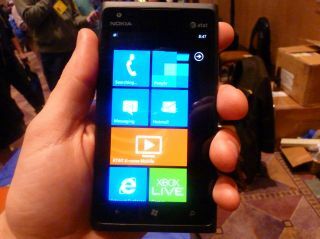 The Lumia 900 is essentially a larger version of the impressive Lumia 800 which debuted in the UK last November. There is, however, the addition of a front-facing camera and a wide angle lens on the rear. A June arrival would open the door for the device to arrive with the forthcoming Windows Phone "Apollo" update, although that's probably a long shot. US users will have access to 4G LTE internet, but with next-generation broadband still a pipedream for us Brits there'll be little use for that 4G chip when the device lands in the UK.